UBS and Credit Suisse shouldn’t bin their turnaround plans just yet. Switzerland’s finance minister Eveline Widmer-Schlumpf managed to wipe 6.5 billion Swiss Francs ($7.1 billion) off the two lenders’ combined market values on Nov. 4, by declaring that they should meet an equity-to-assets “leverage ratio” of at least 6 percent. Although current global rules require only half that, both big Swiss lenders could rise to the challenge. UBS and Credit Suisse can probably manage a 6 percent ratio by 2015 – which is when the leverage ratio requirement can first be reviewed – according to a Breakingviews calculator, Credit Suisse will have a leverage ratio of 5.3 percent by 2015 anyway, assuming it can shed an intended 114 billion Swiss francs, retain 7 billion francs of earnings and issue another 7 billion francs of contingent convertible hybrids. To get to 6 percent, it could either lop off a further 132 billion francs, or raise another 8 billion francs in new capital. If it withheld likely dividend payments, the capital it would need to raise would fall by 5.7 billion francs. UBS looks even better placed. Its restructuring plan implies a 5.6 percent leverage ratio by 2015, assuming 7.2 billion francs of retained earnings, 3.7 billion francs of CoCos and 6 billion francs of capital relief from regulators partly enabled by its restructuring. To get to 6 percent it would need either 4 billion francs of new capital or a further 63 billion francs off the balance sheet. The calculator also doesn’t give either bank credit for additional hybrid instruments that are due to be phased out, or reflect that they would probably be given a more generous deadline than 2015. Yet both UBS and Credit Suisse would struggle if they had to hit a 10 percent leverage ratio. UBS has more capital levers to pull: 23 billion francs in deferred tax-assets would boost the bank’s ratio to 8.2 percent, while paying staff bonuses in contingent capital would get it almost to 9 percent. But Credit Suisse would have to either raise 50 billion francs in new capital, or achieve 620 billion francs in balance sheet reduction. Widmer-Schlumpf sometimes jumps the gun: last month she said an international probe into foreign exchange manipulation had already uncovered firm evidence of wrongdoing, and then retracted her comments. Banks will be hoping for a similar climb down. 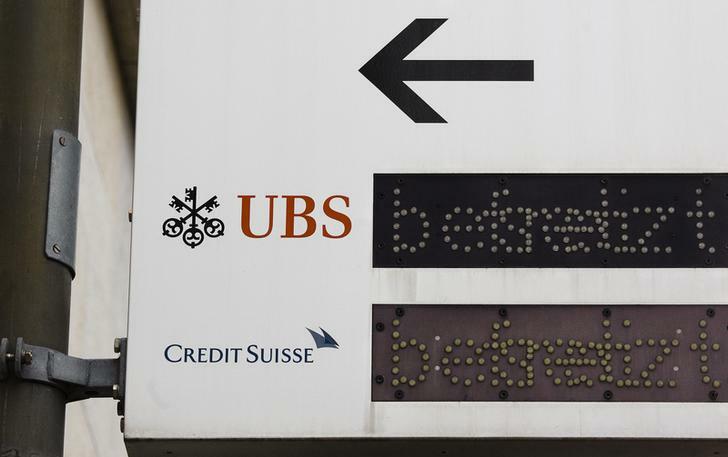 The logos of Swiss banks UBS and Credit Suisse are seen on a sign in Zurich, February 13, 2013. Swiss finance minister Eveline Widmer-Schlumpf said on Nov. 3 that her country’s banks should be subject to higher leverage ratio requirements of 6-10 percent of equity to assets, according to a person with knowledge of the situation. However, any change would be unlikely to happen before a review of Switzerland’s too-big-to-fail financial reforms, due to be presented before parliament at the start of 2015. Widmer-Schlumpf’s comments about leverage were first reported by Swiss newspaper Schweiz am Sonntag.